You would think that tenant move-outs would be easier. After all, it boils down to simple math: if you brought it in, then you have to take it with you when you go. But we often hear complaints from landlords whose tenants decided to leave a little something behind, like the couch, a stack of old pizza boxes outside the recycling bins, or even pets. This can cost a landlord in a number of ways, including delays for the incoming tenant, emergency trash hauling, and possible storage fees. And that’s not to mention complaints from neighbors and city officials. Provide the phone number for large-item trash hauling and explain that any costs belong to the tenant. Explain the space time continuum as it relates to overfilling the dumpster on the day of the move out. There is a finite amount of space, and trash fairies don’t just glide by and sweep away what’s piled up on the ground nearby. Encourage tenants to think ahead and donate unwanted items in advance, or throw away junk over the course of weeks, not hours. Convey any policy you may have on yard sales. Remind tenants to forward their mail — so they get any notices you have to send. Always get a forwarding address. Encourage them to board their pets on moving day to avoid the freaked out cat holed up in the laundry room scenario. No, the next tenant does not want your leftover food or houseplants. If there is storage available, offer it to the tenant a month ahead to encourage a head start on packing boxes. Remind the tenant of the move-out walk through requirement, and make sure they have a copy of the move-in inspection checklist for comparison. Many states require that the landlord store any abandoned items, inventory them, and send out a notice to the tenant to come pick them up. This includes protecting it from contractors who are in the unit getting it ready for the next tenant. Kicking property to the curb may not be an option. Nor is giving it away. Make sure you know whats required of you, or you may be paying the tenant, not the other way around. 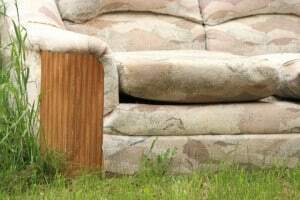 See Getting Rid of What Your Tenants Leave Behind.